What is Mesasix Time Tracker? MESASIX TIME TRACKER is a customizable and smart time tracking web application integrated with Slack. It has customizable bot responses, clocking in and out functions, and notifications. Through the dashboard, a manager can manage all team members and visually understand key metrics such as total time worked by day, week, and month. Be more productive and effective with your work by letting Mesasix Time Tracker manage your work time. It has never been easier to track your team members' work time than with the Mesasix Time Tracker. This application tracks your team members' time from the start to the end of their shift through our Slack commands. 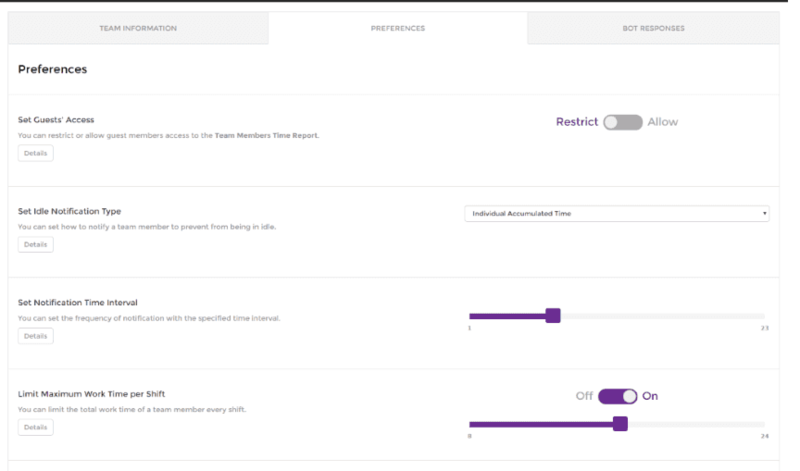 Time reports are available on our dashboard! This feature allows you to view your total work time for any given day. Simply select the month, and view all of your hours worked for each day in that month. This feature is for work time evaluation. It displays the team member's work time totaled by day, week, and month. Be more personal by customizing the bot responses to your team member’s Slack commands. No need to constantly monitor or check if your team members are idle during work hours. Mesasix Time Tracker takes care of it with notifications based on your preferences. 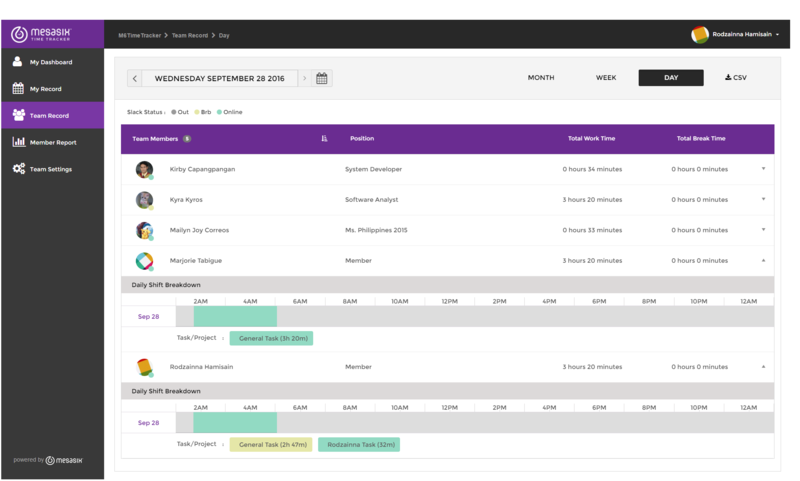 Customize your team’s time tracker to suit your company policies, rules and regulations. Time Clocking. Use these commands on the dedicated Slack channels for Mesasix Time Tracker. Clock in. Starts tracking your time. Clock in with task or project. Starts tracking the time of the project/task specified. Clock out. Stops recording the time. Execute this command when you're going to take your break. Slack Bot pauses recording the time of your current project. When you are back from break, say /back. Slack Bot continues recording your time. This will also resume your last active project. Slack Bot continues recording your time. This will also start recording the task/project specified. Change your current project. Slack bot will pause your last active project and will start recording the time for the new specified project. You can also switch to an already existing project in your shift, slack bot will pause the previous project and resume recording the time for the specified project. Note: Projects and Tasks are case sensitive. Mark a member as back. Show current project/task details -- project, time and status. Assign your default project, this project will be used when omitting the project/task in /in command. Force Clock out a team member (for team owner/admin use only). A notification will be posted on the Slack dedicated channel. Use these commands on any Slack channel. Check your total work time for the current shift. Check your total work time for the current week. Check your total work time for the current month. Check specified team member's current status. Check specified team member's total work time for the current shift. Check specified team member's total work time for the current week. Check specified team member's total work time for the current month. /mesasix feedback Great App - Sends "Great App" to us - Help us make Mesasix Time Tracker a better app. /mesasix help - Will show command list. /mesasix - Will show a menu button. Each button has its own uses. Our friendly Product Support Team is dedicated to help you gain the maximum value and performance from Mesasix Time Tracker. We provide assistance free of charge, and will help you resolve any issues quickly and effectively. You can contact our Product Support Team through both chat and email. How much does Mesasix Time Tracker cost? Does it cost money to use this app? Adding Mesasix Time Tracker to Slack is free and does not require a credit card, but to continue using the app commands after more than 7 days, you'll need to pick a plan. Below are the subscription plan details. You will be charged $2.00 per selected team member per month. How does Mesasix Time Tracker work? Mesasix Time Tracker tracks and displays total work time based on the shift instead of calendar date. The total work time starts at clock in /in and ends at clock out /out . However, if you manually clock out or have been automatically clocked out and clocked in again before 12:00 midnight, the accumulated time will be added to the total work time of the current shift. 4. Select team members who you want to use Mesasix Time Tracker. They can now start performing the clocking activities. The date and time are displayed based on the user's slack account time zone or based on the time zone that is set in the Preferences tab. Visit the features page for more details. Export to CSV format updates. Show specific project report per user at Member Report. Bot notification to remind users to clock in. Force out users at a specified time. Old commands are back. You can either clock in using /mesasix in or /in. Custom date range at team member's report. Admins and Owners can now be selected/deselected. Team admins and owners can now choose member that will be allowed to use Mesasix Time Tracker. Added project/task tracking and switching between projects/tasks just use /switch [project or task]. Admins and owners can now adjust their or their members' clocking entries in Members Report. Admins and owners can now delete records (cannot be recovered) in Members Report. Added In and Out date-time in CSV reports except for team weekly and team monthly. Team Admin / Owner can now view their member records on a given date range in Member Report. Multi-channel support. You can now select and organized your team members clocking activities on up to 10 different Slack channels. Added optional parameter when clocking /mesasix in. See details in features page. Added option to grant access to Team Record for guest or core members. Easier confirmation on notification using interactive buttons. Emoji's picker for customized bot responses. Sync the information on the Slack account with the application account. Please email us at support@mesasix.com or use our chat support at the bottom right side of this page. We accept all major credit cards including Visa, MasterCard, American Express, Discover, JCB, and Diners Club. Debit cards with the Visa or MasterCard logo are also accepted. * Only selected members in Team Setting. Is Mesasix Time Tracker online payment safe? Yes, security is our top priority. We don’t store your credit card details, and our online payment uses Stripe to secure the payment transaction. You can read more about Stripe’s Security here. I added a time tracking channel but I can't see it in my channel list at Settings. What should I do? 3. Click on the "Sync to Slack" button. 5. Look for the channel in the channel list and select it. Team members forget to clock in. What can I do? 4. Look for "Set Start of the Shift Time"
Can team members edit their own time? 2. Go to "My Record"
7. Continue editing and when you're done, click the "Send for Approval" button. How do I edit my team member's time? 4. Select team members who you want to edit the time and specify the date. 5. Click the "SHOW REPORT" button. 6. Click one of the strips in the progress bar. 7. Edit your team member's time. 8. Click the "SAVE CHANGES" button. If you don't see any changes. Please reload the page. What is a selected or allowed member? A member added to the list of allowed users to use the time tracker. Only admins and owners can add a member to the list. When is the billing date? We bill you at the beginning of every monthly billing cycle. Your bill amount depends on the number of selected members in your Mesasix Time Tracker team account. If the number of selected members increase/decrease in the middle of a billing cycle, the new payment will take effect for the rest of the cycle. What happens if I don't find the service useful? You can cancel your account any time in your Settings > Payment Details > Cancel Subscription or you can also email us at support@mesasix.com. Do I get a refund if I cancel my subscription while in the middle of billing period? No, but we offer a 7 day FREE trial. After that you will have to subscribe to one of our core plans and continue using the time tracker until your monthly billing subscription expires. I cancelled my subsciption, how do I subscribe again? 4. Click on the "Payment Details" button. 5. Click the "Subscribe" button. 6. Fill up the neccessary fields. 7. Click the "Pay" button. I can't use /in, /out, etc eventhough the app is installed. 4. Accept the terms and condition. 5. Click the "Add to Slack" button. 6. You will be asked to sign in to your team if you're not yet signed in. 7. Click the "Authorize" button. 8. Click the "Proceed" button. 9. You will be redirected to your Time Tracker Dashboard. Don't have Mesasix Time Tracker account yet? Sign in with your Slack account. Mesasix Time Tracker will authenticate user from their Slack account using Slack OAuth. Please read these Terms of Service carefully before using any Mesasix services, including Mesasix Time Tracker or any other service, software, or product (the "Service") provided by Mesasix ("us", "we", or "our"). By accessing or using the Service you agree to be bound by these Terms. If you disagree with any part of the terms then you may not access the Service. These Terms of Service are provided in addition to the Master Subscription Agreement between you and Mesasix. In the event of a conflict between these Terms and the Master Subscription Agreement, the Master Subscription Agreement shall control. You are at least 18 years old or you are under the supervision of a parent or guardian. Mesasix grants you a limited and revocable license to use the Service. The Service may not be reproduced, duplicated, copied, sold, resold, visited, or otherwise exploited for any commercial purpose without our express, written consent. Mesasix reserves the right to refuse service, terminate accounts, remove or edit content, or cancel orders or portions thereof, in our sole discretion, if Mesasix determines that any client conduct violates applicable law or is harmful to the interests of Mesasix. You are prohibited from uploading to, posting on or transmitting through Mesasix any information or material that (a) violates or infringes the proprietary rights of any person; (b) is libelous, threatening, defamatory, obscene, indecent, pornographic or could give rise to any civil or criminal liability under any law; or (c) includes any viruses, worms, Trojan Horses or other harmful code or properties. If you use the Service, you are responsible for maintaining the confidentiality of your account information and password and for restricting access to your computer, and you agree to accept responsibility for all activities that occur using your account information. All content on Mesasix, including text, graphics, button icons, images and software belongs exclusively to Mesasix. The compilation, arrangement, and assembly of all such text, graphics, button icons, images and software belong exclusively to Mesasix. Mesasix, its logos and trade names are registered trademarks of Mesasix and its affiliates. The use of any Mesasix trademark is prohibited without the prior written consent of Mesasix. All other trademarks not owned by Mesasix or its affiliates that appear on the Service are the property of their respective owners. We may terminate or suspend access to our Service immediately, without prior notice or liability, for any reason whatsoever, including without limitation if you breach the Terms. All provisions of the Terms which by their nature should survive termination shall survive termination, including, without limitation, ownership provisions, warranty disclaimers, confidentiality provisions, and indemnity and limitations of liability. Some parts of the Service are billed on a subscription basis ("Subscription(s)"). You will be billed in accordance with the terms of any such Subscription. Our Service allows you to link, store, share, collate, organize, and otherwise make available certain information, text, graphics, financial information, or other material ("Content"). You are responsible for the content linked, stored, shared, or otherwise made available on the Service. Our Service may contain links to third-party web sites or services that are not owned or controlled by Mesasix. Mesasix has no control over, and assumes no responsibility for, the content, privacy policies, or practices of any third party web sites or services. You further acknowledge and agree that Mesasix shall not be responsible or liable, directly or indirectly, for any damage or loss caused or alleged to be caused by or in connection with use of or reliance on any such content, goods or services available on or through any such websites or services. Services provided by Mesasix and the transactions conducted upon and through it are provided to you on an "as is" basis. Mesasix makes no representations or warranties of any kind, express or implied, as to the operation of the Services or the information or content therein. To the extent allowed by law, Mesasix disclaims all warranties, express or implied, including but not limited to, implied warranties of merchantability and fitness for a particular purpose, non-infringement, title, quiet enjoyment, data accuracy and systems integration. To the extent allowed by law, Mesasix will not be liable for any damages of any kind arising from your use of the Site including, but not limited to, indirect, incidental, punitive, exemplary, special or consequential damages. Our Website contains links to third party websites. If you follow a link to any of those third party websites, please note that they have their own privacy policies and that we do not accept any responsibility or liability for their policies or processing of your personal information. Please check these policies before you submit any personal information to such third party websites. If you have questions or complaints regarding this privacy statement or our privacy practices, please contact us at support@mesasix.com. 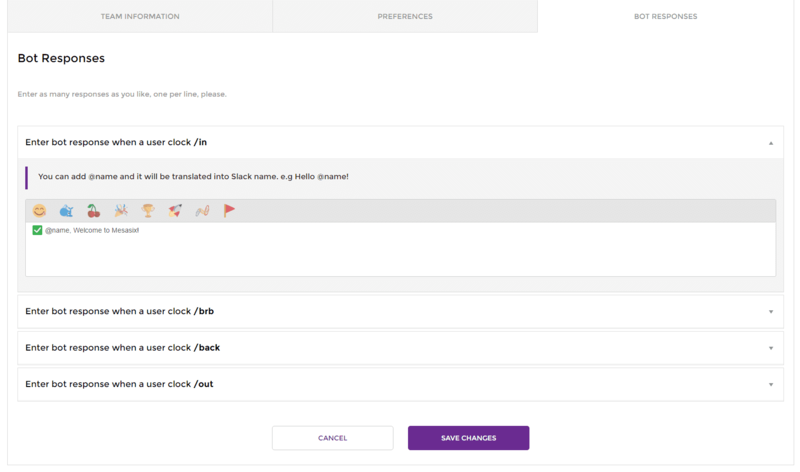 When you integrate Mesasix Time Tracker in your Slack team, the Slack API provides us information about your team and it's members, specifically names, emails, usernames, timezones, profile pictures, team domains, and team names. This information is visible to the members of your Slack team and Mesasix, but not anyone else. You may also provide us with information during your conversations with Mesasix Time Tracker on Slack and inside Mesasix Time Tracker's slash commands. If you email us, we may keep your message, email address, and contact information to respond to your request. The additional information described in this section is also private. Mesasix Time Tracker uses Facebook pixel to help us track conversions from Facebook ads, optimize ads based on collected data, build targeted audiences for future ads, and remarket to qualified leads. Mesasix Time Tracker uses Mixpanel for analytics, it tracks user interactions with web and mobile applications and provides tools for targeted communication. Data collected is used to build custom reports and measure user engagement and retention. When you use our Services, we may receive information such as your IP address, browser type, operating system, the referring web page, pages visited, location, your mobile carrier, device information (including device and application IDs), search terms, and cookie information ("Log Data"). We receive Log Data when you interact with our Services, for example, when you visit our website, sign into our Services, interact with our emails or interact with Mesasix Time Tracker on Slack. We may also receive Log Data when you click on, view or interact with a link on our Services to a third-party application, such as when you choose to install another application through Mesasix Time Tracker. Mesasix Time Tracker uses Log Data to provide, understand, and improve our Services. Mesasix Time Tracker uses a variety of third-party services to help provide our Services, such as hosting our site and blog, and to help us understand and improve the use of our Services, such as Hotjar. These third-party service providers may collect information sent by your browser as part of a web page request, such as cookies or your IP address. Third-party ad partners may share information with us, like a browser cookie ID, website URL visited, mobile device ID, or cryptographic hash of a common account identifier (such as an email address). When you integrate Mesasix Time Tracker in your Slack team, the Slack API provides us information about your team and it's members. Your information specifically your name, email, username, timezone, profile pictures, team domain, and team name is saved in our database. We do not store your password, Slack handles the authentication when you sign in to our dashboard. We do not disclose your account details, postal or email addresses to anyone except when legally required to do so. It is your responsibility to keep your Slack password secure. We keep you personal information even when you unsubscribe to our plan or when your free trial expires. However, the information in our database will no longer be updated if your team has unsubscribed or deleted Mesasix Time Tracker in your Slack App directory. We may share or disclose your information at your direction, such as when you authorize a third-party web client or application to access your Mesasix Time Tracker account. We may share or disclose your non-private, aggregated or otherwise non-personal information after we have removed any private personal information (such as your name or your company name). Amazon Web Services: Hosting services. Boomtrain: a customer messaging service used by us to provide customer support. Hotjar: an analytics tool we use to understand your use of our Website. MailChimp: used to send administration of service emails such as email verification, product updates, password reset and welcome email; and other potential marketing messages where you have given your explicit consent for us to do so. Mixpanel: tracks user interactions with web and mobile applications and provides tools for targeted communication with them. Data collected is used to build custom reports and measure user engagement and retention. Stripe: used by us to process online payments. Ensure that your personal information is updated and correct. Ask us to stop processing your personal data at any time. Request to provide you a copy of all your personal data. If you are a registered user of our Services, we may provide you with tools and account settings to access or modify the personal information you provided to us and associated with your account. The profile information that we receive from Slack can be modified through your Slack account, our records will be updated when you sync your team information in your Team Settings and none of the previous information will be saved. You can also permanently delete your Mesasix Time Tracker account by emailing us at support@mesasix.com. Please note that Mesasix will not charge you in any request we receive to exercise any of your rights stated above. All information you provide to us is stored on our secure servers, and accessed and used subject to our security policies and standards. Sensitive information between your browser and our Website is transferred in encrypted form using Secure Socket Layer (“SSL”). When transmitting sensitive information, you should always make sure that your browser can validate the Mesasix Time Tracker certificate. Unfortunately, the transmission of information via the internet is not completely secure. Although Mesasix will do its best to protect your personal data, we cannot guarantee the security of your data transmitted to our Website or through our Services. Any transmission is at your own risk. Once we have received your information, we will use strict procedures and security features in an effort to prevent any unauthorized access. Slack, Slack API and Slack logo are trademark of Slack Technologies, Inc.
Stripe, Stripe API and Stripe logo are trademark of Stripe. Mesasix Time Tracker is a trademark of Mesasix LLC and are not created by, affiliated with, or supported by Slack Technologies, Inc.